It was a perfectly delivered masterclass by Juventus on Wednesday as Barcelona crashed out of the Champions League 3-0 on aggregate with Gerard Pique suggesting that the Italian giants deserved to progress and could in fact go on to win the tournament. Massimiliano Allegri’s charges were aggressive in their pressing and defending their 3-0 first-leg lead for their lives as the visitors stifled Los Cules all evening long. Whilst he was in the headlines for a tweet sent out about Real Madrid’s victory over Bayern Munich on Tuesday evening, Pique was in a reflective mood as he confirmed that the Turin side deserved to progress to the semi-final. “They are a great team and in general they were better than us, they deserved to progress and I wish them the best because they can win the tournament,” he explained to BeIN Sports. 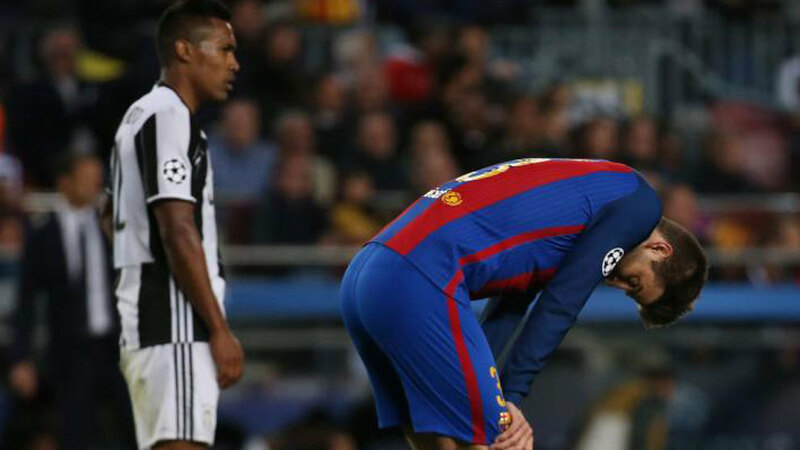 The Blaugrana’s poor performance in Turin left Luis Enrique’s side with a mountain to climb and the Spanish defender admitted that they left themselves too much to do at the Camp Nou. “We may have created chances but we had to climb such a mountain,” he added. Leonardo Bonucci and Giorgio Chiellini were once again spectacular in defence as they kept Luis Suarez, Neymar and Lionel Messi quiet for the entire match and the importance of Juventus’ defensive play wasn’t lost on the 30-year-old. “They are Italians, they know how to defend well and they are specialists in that area, they have come to play their style of football and have done it very well,” said Pique. Bouncing back is imperative for Los Cules now with the small matter of El Clasico to come on Sunday. Anything other than a victory at the Estadio Santiago Bernabeu would all but hand Los Blancos the LaLiga title and Pique believes that his team has the capability to go and spoil the party in the Spanish capital. “We are going to the Bernabeu to compete and to try and win, we have been good there in recent years and whilst we aren’t at our best, we can win,” he added. Emotions around the Catalan giants have been running rather high in recent months with some sections of the club’s support losing patience with the hierarchy in charge of the club. However there was quite the spectacle just before the final whistle on Wednesday as the entire home faithful rose to their feet to show their appreciation to the players despite such a defeat, something that really took Pique’s attention. “I think this is a hard defeat to take but the fans were fantastic and they kept singing,” the Spaniard noted.